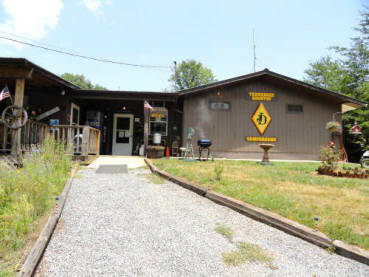 The Tennessee Country Campground & RV Park LLC. is located at Exit 56 on Interstate 75 in Niota, Tennessee, approximately half way between Chattanooga and Knoxville in McMinn County. We offer 20, 30, and 50 amp electric on all sites with city water, sewer, free cable tv, and free wifi. Also on property we have mens and ladies restrooms with showers. We have our own coin op laundry with two full size washers and dryers. Our office building has a large front porch with rocking chairs and a bench seat swing. Inside the building is a large screen TV, Dart board and coin op regulation size pool table. 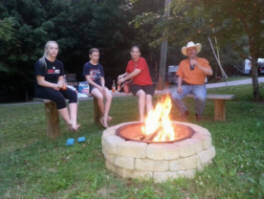 We have a fire ring for community campfires which we have often on Friday or Saturday nights when weather permits. Any guest may start a fire in the fire ring and we just about assure you that other guests will show up at your fire. If you prefer a private fire at your campsite that is okay too. We are open all year for overnight guests as well as short term and long term guests. We offer a grassy area for tent camping that is very near our rest room facilities. Tent campers are welcome. We are also pet friendly, just please pick up after your pets. Owners live on property , Come visit Us ! 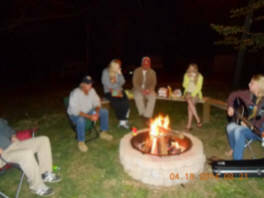 TENNESSEE COUNTRY CAMPGROUND & RV PARK LLC.